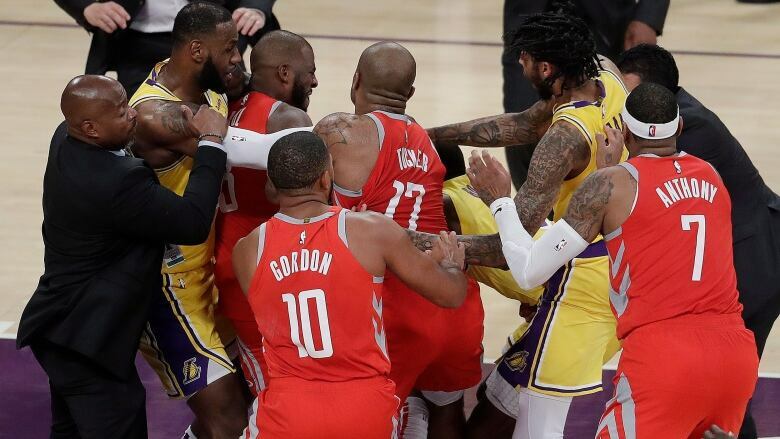 Los Angeles Lakers teammates Brandon Ingram and Rajon Rondo, along with Houston Rockets star Chris Paul, were suspended without pay Sunday for an on-court fight during the teams' Saturday night game. The incident is costliest to Paul, who will be fined a total of $491,782 US. Paul is president of the NBA Players' Association. He began serving the suspension Sunday night when the Clippers played the Rockets. Rondo will be fined a total of $186,20, while Ingram's total is $158,816. Rondo has been suspended for instigating a physical altercation with Paul, and spitting and throwing multiple punches at the Rockets star. Paul was suspended for poking at and making contact Rondo's face and throwing multiple punches at him. Ingram's suspension is the most for an on-court incident since Metta World Peace levelled James Harden in a game at Staples Center in April 2012.